Remember Chariots of Fire and the story of Eric Liddell, the runner who withdrew from the 100-meter dash in the 1924 Olympics rather than run on Sunday? Well, after his dramatic win of the 400-meter race, he became a missionary to China and wrote The Disciplines of the Christian Life. By all accounts, this is a very worthwhile book. 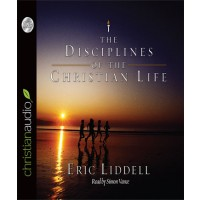 I have not yet listened to it, but I wanted to share it with you because the audiobook download is free from christianaudio.com only during the month of August. Disclosure: I receive no compensation for sharing this information with you. – For more tips, see Encourage One Another Wednesday, Women Living Well Wednesdays, Works For Me Wednesday , Raising Homemakers, and Frugal Friday.